AKA Ronald William Artest, Jr. Highly talented basketball player, one of the best in the game today. When he was with the Indiana Pacers, he initiated an unfortunate brawl (now known as the infamous "Malice at the Palace") on 19 November 2004, after a fan, John Green, threw a cup of Diet Coke at Artest. Artest charged into the stands to attack, but went after the wrong fan, and subsequently Pacers players and Pistons fans began battling. Artest was suspended for 73 games (the remainder of the season), losing $5M in compensation, but he has been a model citizen ever since. 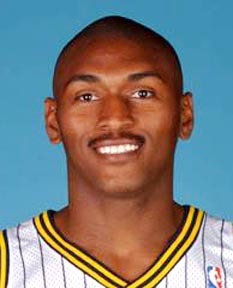 Artest later issued a Twitter plea for information to help track down Green, the man who drenched him in cola and instigated the melee. He eventually phoned Green to talk about the incident, and both men have said they are now friends. After winning an NBA title with the Los Angeles Lakers in 2010, Artest auctioned off his championship ring, raising $500K and donating the proceeds to a charity which works with high-risk youth on mental health issues. In 2011 he filed court papers, legally changing his name to Metta World Peace.